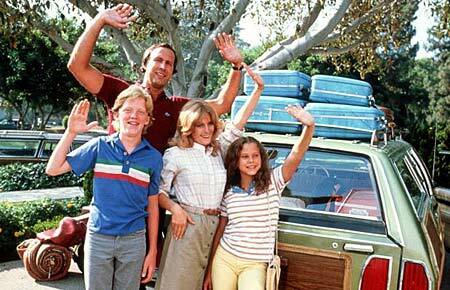 The very idea of a family summer road trip evokes a curious mix of excitement and trepidation. I remember the annual drive from Denver to Kansas fondly; how Mom would point out every cow in every prairie field (my sister and I would roll our eyes) and then redeem herself by finding the only motel in Salina with an outdoor pool and water slide. But, when I think about embarking on a similar journey with my kids, I realize I’ll be trapped in a vehicle with them between Calgary and somewhere far away, that the boredom of the miles will turn me into a modified version of my mother (“Look children — another waterfall!”), and then I cringe and wonder why we don’t just fly. A Family Roadster is not a requirement for a successful summer vacation. 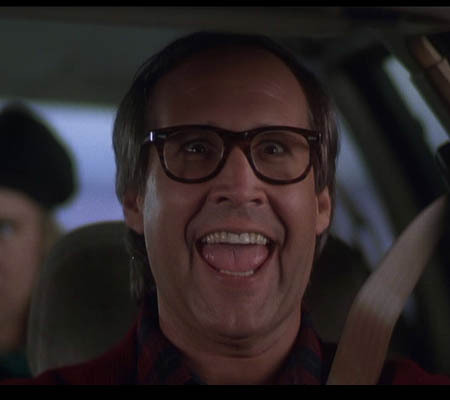 As Clark Griswold will tell you: “Why aren’t we flying? Because getting there is half the fun! You know that.” I recently rewatched the original Vacation movie. Thirty years on it’s still funny if over-the-top. Vacation is also instructive for families thinking of saving some money and bonding in a car en route to the beach/amusement park/national monument this summer. 1. For getting there to be fun, you have to actually stop and see and do things along the way. One of Clark’s mistakes is that he didn’t budget enough time to make it from Chicago to Wally World in California. They couldn’t stop to see the St. Louis Arch or visit the world’s largest ball of twine in Kansas. Involve the family in the trip planning and you’ll be able to gawk at the world’s largest truck in Sparwood, B.C., for example. 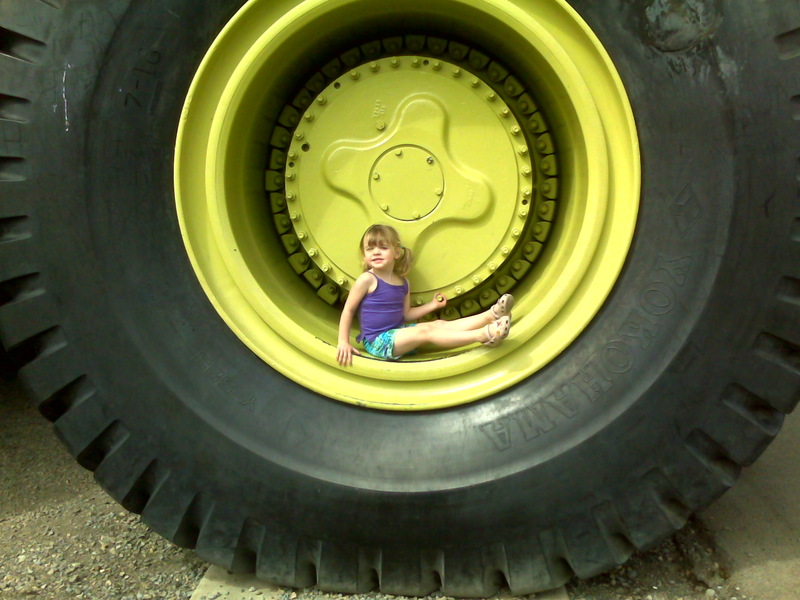 Daughter posed on giant truck tire = priceless vacation memory. 2. Motels are great; they save you money and often have a pool. Just make sure there aren’t boxes next to the beds that accept quarters. 3. Don’t detour out of the way to visit friends or relatives you can’t stand. Life is too short and besides, your redneck cousins might introduce your daughter to weed, your son to nudie mags and then foist their Aunt Edna equivalent on you for part of the drive (and we all remember how that ended). 4. Don’t make Dad do all the driving. Clark clocked so many highway hours while Ellen, Edna and the kids slept, it’s no wonder he cracked (robbed a restaurant, went skinny dipping with Christie Brinkley, held a Wally World security guard hostage). Still, you have to admire his dedication to family fun in the road trip format. 5. Call ahead to make sure your destination will be open. Beaches and national parks don’t typically close, but attractions sometimes do, as the Griswolds found out upon arrival at Wally World. Oh yeah, and since you’ll be spending a lot of time in the car, remember to bring the children’s Walkman equivalents. This entry was posted in Travel and tagged family road trip tips, family travel, family vacation, travelling with kids, travelling with kids in a car, Vacation with kids in car. Bookmark the permalink. Sound advice! We never pass up the opportunity to see the quirky roadside attractions, although the world’s largest ball of twine still eludes us! Wow really good enjoyments with kids on road. Really this was very interesting or enjoyable for everyone. I was happy to see this activity. Thanks so much for sharing your memories with us!